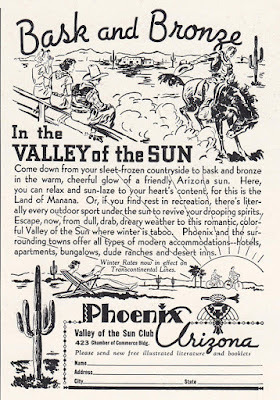 If you grew up in Phoenix, the ad at the top of this post probably just seems comical to you - "Bask and Bronze". Since I grew up in Minneapolis, I can really understand this. 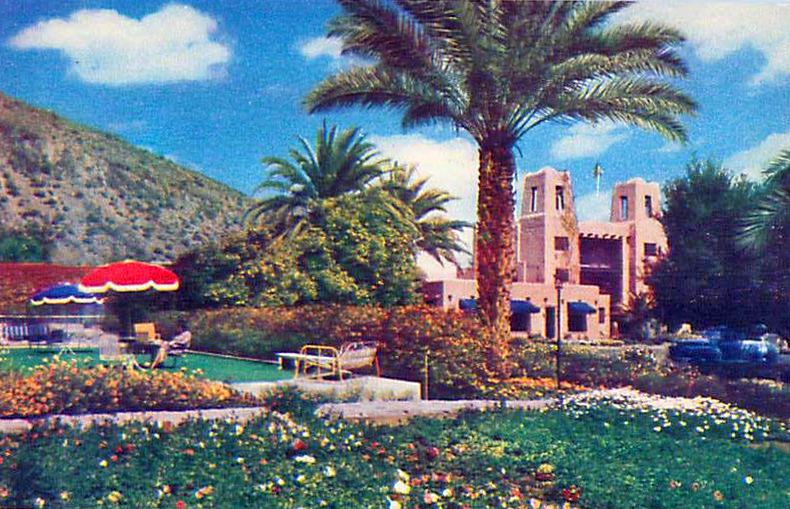 In fact, my parents used to vacation in Scottsdale, and come back looking "bronzed and fit". My dad was always one of those men who were never shy about taking off his shirt, and he would get a "movie star" tan. As I recall, mom would burn and peel, but she still tried to tan. I never had a suntan in Minneapolis in the winter. Some of the kids in my high school would come back with "ski tans" on their faces, and the wealthier ones would come back with a genuine tan that told everyone that they had been somewhere nice, like Arizona. Attitudes about getting a suntan have changed dramatically in my lifetime. Nowadays you're more likely to hear someone talk about melanoma than saying you look "bronzed and fit". But it's like a lot of things that people did back then, they didn't know. The first time I heard about the connection of suntanning to skin cancer was in the 1980s. Something people used to do was to "work on their tan". While on vacation away from dull, drab, dreary weather, they would lie out in the sun, often using oil to increase the burning effect, and even using little reflectors under their chin, and get tanned. Going back home without a suntan was simply not done! People would ask, "I thought you were in Phoenix? Where's your suntan? ", and without the tan people suspected that you had actually just spent the last few weeks in Duluth, or somewhere. Speaking for myself, I never had much of a tan until my mid-thirties, when I bought my house in Glendale, Arizona, and found myself getting burned often while working in the yard. I learned to use sunscreen. I haven't lived in Minnesota since I was 19, and I sometimes wonder how people nowadays show off that they've been to Arizona in the winter? I would imagine that they still show off suntans, but just not get quite as burnt. 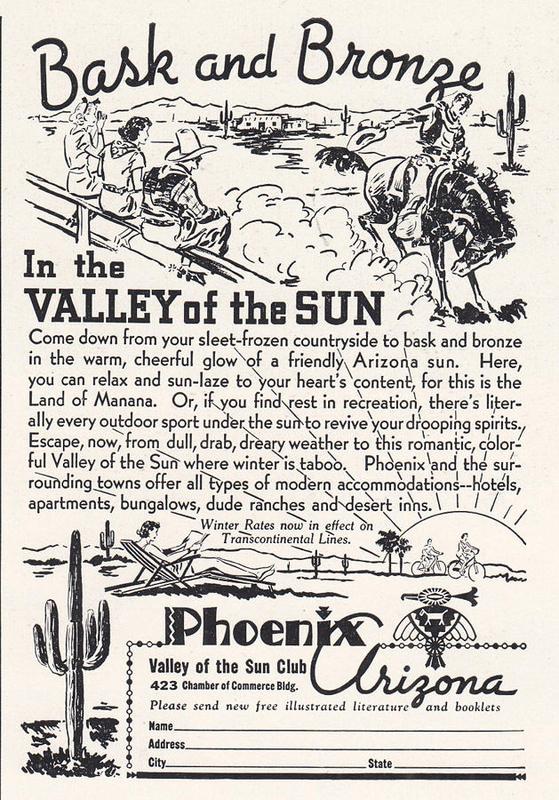 Image at the top of this post: 1941 ad for the Phoenix, Arizona Valley of the Sun Club. Since I grew up in Minneapolis, Minnesota, and have spent my adult life in Arizona, and California, I had to learn to control my Minnesota slang. I found that it caused difficulty with communication. Of course if I'd never left Minnesota, I would have no idea that I was using so much slang - everyone there understands me. And if I had chosen to only hang out with people from Minnesota when I moved out west, I wouldn't have had to adjust. But I wanted to talk to people who were different from me, and when I did that, I realized how poor my communication was with the slang that I had grown up with. For people who live in one place all of their lives, this just sounds like nonsense - your culture is invisible to you unless you see it through other people's eyes. One of the things you'll hear me say is the word "yes". I will often say it as if it had a period after it: like this: Yes. Back in Minnesota, I rarely said yes - I said "You bet'cha" or "sure" or often "yep". And if you've lived in Minnesota, or hung around people who talk that way, you may be saying "what's the big deal?" in which case you're using more confusing slang. Minnesota people use a lot of that type of slang, and I've been told it's related to playing cards: A good deal, a bad deal, etc. When I became a teacher, in my late thirties, it became even more important. I would often have students who used a translator during my lectures - and slang just makes a mess of things. I prided myself on my crisp and clear midwestern accent, and found that I still had to clean up some of my slang. I'm sure that no matter how hard I try, I will always sound like someone from Minnesota. When I'm with my California friends I tend to mirror their way of speaking, which I call "Hollywood". With my hispanic friends I'm more inclined to throw in a bit of Spanish, but just a bit. My inflections become more musical. If I care about you, I will do my best to accommodate you. And I've met some wonderful people who are very different from me. They've never tasted Hamm's beer, or been to a Twins game. They've never walked across the Mississippi River, or even been to Southdale. To me, they were exciting and exotic, and I wanted to not just look at their world, I wanted to be part of it. For them I learned to speak their language, it was the least I could do. 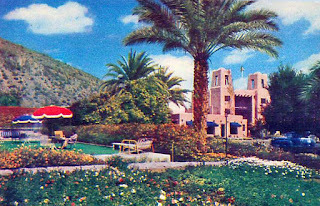 Image at the top of this post: The Jokake Inn in the 1950s, Scottsdale, Arizona.